On April 7, thanks to local Dad, Tim Keenan, Franklin will be getting their very own Ninja Warrior fitness gym with the grand opening of Strive Ninja Fitness on Kenwood Drive. 2017 top female American Ninja Warrior contestant and Massachusetts teacher, Allyssa Beird will be on hand to provide inspiration and coaching to the many future Ninja Warrior hopefuls that will be in attendance. Tim, father of two junior Ninja Warrior competitors has been traveling quite a distance to provide this unique sport for his children. "I'm very excited to bring this extremely positive and supportive sport to this community," said Tim. "Strive Ninja Fitness hopes to provide an environment where kids (and adults) of all ages and abilities can grow their strength, agility, balance, coordination and most importantly, their confidence." Classes and open gym training times are available for both kids and adults. Kids classes are offered in 8-week sessions. Each class session is followed by an end-of-class competition where students will have a chance to run through a course that highlights the skills they learned. Obstacles and focus areas vary from week to week including, but not limited to: quad steps, swinging rings, ring toss, cannonballs, monkey bars, various balance obstacles, cargo net, rope climb, cliffhanger and the ever-famous warped wall! For more information on classes and to sign up online, please visit: http://www.striveninja.com/kids-classes. This special VIP Pre-Opening Event is FREE and open to the first 50 kids* who are signed up for 8-week Spring Session classes. The event features a meet and greet with Allyssa Beird, photo/autograph opportunity, along with obstacle circuit training and instruction provided by Beird and Strive Ninja Fitness Coaches. A parent/legal guardian must sign electronic waiver for each participant. For more information, please register for a Spring Session Class at: http://www.striveninja.com/kids-classes. Strive Ninja Fitness will officially open its doors at these 2 FREE public events. Owner Tim Keenan will provide opening remarks, and introduce special guest trainer Allyssa Beird along with the Strive Ninja Fitness Coaches. Obstacle Circuit Training is limited to the first 50 kids to ensure safety and fun for all. PRE-REGISTRATION IS REQUIRED! Pre-Register online at: http://www.striveninja.com/grand-opening-event. 1 PM is now sold out. 2:30 PM is Open. Strive Ninja Fitness is an 800 square-foot ninja warrior training facility for athletes of all ages and abilities with obstacles like those seen on the show American Ninja Warrior such as the warped wall (8', 10', 12',14.5'), salmon ladder, quintuple steps, jumping spider, swinging rings, cannonballs, cliffhanger, wingnuts, and many more. 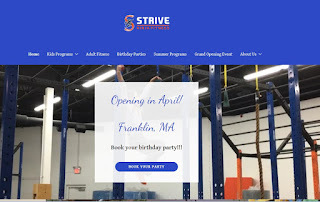 Strive Ninja Fitness provides classes, summer programs, birthday parties and corporate events under the supervision of our CPR-Certified and trained Strive Ninja Fitness Coaches. For more information, please visit: http://www.striveninja.com.